Sportspersons who won the gold, silver and bronze medals for India, do we appreciate them enough?" asked the iconic India batsman in his maiden Rajya Sabha speech on Facebook Live after he was prevented from speaking in the House on Thursday by a raucous Opposition demanding an apology from the Prime Minister for his remarks against Dr Manmohan Singh. Sachin Tendulkar said he had wanted to raise the issue of financial security for national level athletes in the Parliament, a day after being stopped from making his maiden Rajya Sabha speech due to protests in the Upper House. Tendulkar on Friday took to multiple social media platforms, including Facebook and Twitter, to express his views on the prevailing sporting scenario in the country. 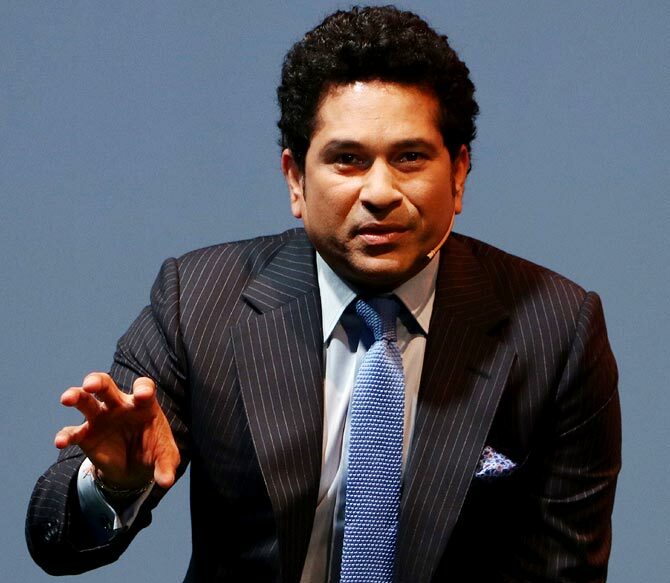 "Financial security is often a challenge when any sportsperson decides to focus on sports alone as their career," Tendulkar said in the speech which was to be delivered on Thursday. "I am aware that the Government, through it's many institutions, employs sports-persons and supports them which we all appreciate. "But we have many national, state and district level retired athletes who don't have a proper job. While ensuring their financial stability, we must also keep their minds engaged. Their skills and passion for sports would be best utilized for coaching our future generations." Incidentally, Tendulkar had already written to Prime Minister Narendra Modi, requesting inclusion of international medallists in the Central Government Health Scheme. Tendulkar cited the examples of national level hockey player Nauri Mundu from Jharkhand, who doubles up as a teacher and works in the farm to make ends meet along with Sita Sahu, a medalist at the Special Olympics in Athens in 2011, who is selling golgappas to manage her life. "We need to create an organization and engage these athletes to train our school children and identify talent at an early age. There is so much that these athletes have to offer back to society," he said. Tendulkar also emphasised on the importance to have health insurance for the national athletes. "It is also imperative to have health insurance for all our national level athletes. The struggles faced by hockey great Mohammad Shahid in his last days reiterates the need to prevent such unfortunate situations." Tendulkar also referred about India's first Olympic swimmer late Shamsher Khan in his speech. Khan had participated in the 1956 Melbourne Olympics and qualified for the 200m butterfly final. "The life of Shamsher Khan is another reminder of how we have failed our national heroes ... Our national heroes should be able to live a respectable life. Extending CGHS benefits to them is a step in that direction. "I appeal to the Hon'ble Minister of Health & Family Welfare J.P. Naddaji to kindly consider my request on this issue which is in line with the recommendations put forth by the AICS," he added. Tendulkar also proposed to immortalise sportspersons by making their lives part of the curriculum at schools. "Sportspersons who won the gold, silver and bronze medals for India, do we appreciate them enough?" asked the iconic India batsman. "These champions, our heroes, didn't have the best of everything, but they made the best of everything. I think it is extremely important that youngsters learn about our sporting history. "I sincerely feel that the lives of these champions should be part of our curriculum. In the year 2009, this August House passed the Right of Children to Free and Compulsory Education Bill. It is my humble suggestion that the Act be amended to include the Right to Play." The 44-year-old Mumbaikar also stressed on the need to have a dedicated squad guiding our athletes' preparations for the Olympics. "Before the Olympics or a major sporting event, our expectations go sky rocketing. I realize that things are changing for the good and that we have adopted a long-term approach on preparation," he said. "Along with early identification of talent, we must also have a dedicated squad guiding our athletes' preparations. I feel it is extremely importantly to have full time support staff around our athletes and winning medals should become their target as well." Tendulkar also talked about his vision of a healthy and a fit India, besides raising the issue of India being the diabetic capital of the world with over 75 million people affected by the disease.